According to NOAA’s Climate Prediction Center, July of 2014 was the 4th hottest in the 135-year global temperature record. Land surface temperatures measured 10th hottest in the global record while ocean surface temperatures remained extraordinarily hot, tying July of 2009 as the hottest on record for all years on measure over the past two centuries. Overall, land temperatures were 0.74 C above the 1950-1981 average and ocean surface temperatures were 0.59 C above the same average. These new record or near record highs come after the hottest 2nd quarter year in the global temperature record where combined land and ocean temperatures exceeded all previous global high temperatures in the measure. Few regions around the globe showed cooler than average temperatures during July with zones over the east-central US, in the Atlantic just south of Greenland, and off South America in the Southern Ocean as the only regions showing cooler than normal temperatures. Record warmest temperatures ranged from Scandinavia to Iceland to Northeast Siberia, from California to Alaska to the Northeast Pacific, along a broad stretch of Pacific Ocean waters east of the Philippines and New Guinea, in pools in the North and South Atlantic Oceans off the coasts of North and South America, and in spots from Australia through the Indian Ocean to South Africa. Land and Ocean temperature anomalies for July of 2014. Image source: NOAA’s Climate Prediction Center. Overall, most of the surface of the Earth featured above average to record warmest conditions, while a minority of the Earth’s surface showed average or below average temperatures. These new global heat records were reached even as slightly cooler than average waters began to up-well in the critical Eastern Equatorial Pacific region. A powerful Kelvin Wave that initiated during late winter and spring of 2014 failed to set off a summer El Nino and finally faded out, reducing heat transfer from Pacific Ocean waters to atmosphere. Even so, the ocean to atmosphere heat dump was enough to set off two record hot months for May and June and a record hot ocean surface month for July as ocean surface waters remained extraordinarily warm across many regions. 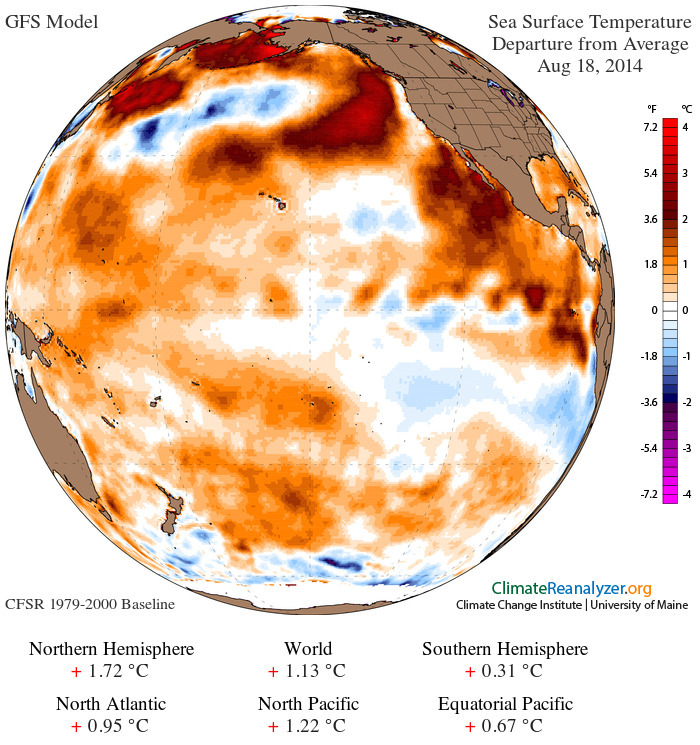 Ocean surface temperatures remained at or near record hot levels during July and August of 2014 despite a failed El Nino development in the Equatorial Pacific. The above graphic shows global water temperatures for August 18, 2014, at an extraordinary +1.13 C above the already hotter than normal 1979-2000 average. Image source: University of Maine. Though the atmosphere failed to respond to a powerful Kelvin Wave issuing across the Pacific earlier this year, stifling the development of a predicted El Nino, it appears a new warm Kelvin Wave is now beginning to form. Moderate west wind back bursts near New Guinea initiated warm water down-welling and propagation across the Pacific Ocean during July and early August. The down-welling warmth appeared to link up with warm water upwelling west of New Guinea and began a thrust across the Pacific over the past week. New warm Kelvin wave forming in the Equatorial Pacific. Image source: Climate Prediction Center. These sub-sea temps are rather warm for an early phase Kelvin wave and may indicate another ocean to atmosphere heat delivery is on its way, despite a broader failure of El Nino to form by this summer. Typically, strong Kelvin waves provide the energy necessary for El Nino to form. The heating of surface waters due to warm water upwelling in the Equatorial Pacific tends to set off atmospheric feedbacks that perpetuate an El Nino pattern in which waters remain warmer than average in the Central and Eastern Equatorial Pacific for many months. Without these atmospheric responses, El Nino cannot form. During 2013 and 2014, strong Kelvin waves forming during spring time were not enough to over-ride prevailing and historically strong trade wind patterns thereby allowing El Nino to emerge. During recent years, scientific analysis has confirmed that a negative Pacific Decadal Oscillation together with record strength trade winds has suppressed El Nino formation and ocean to atmosphere heat transfer, leading to a temporary slow down in atmospheric temperature increases even as world ocean temperatures spiked. Global ocean heat content for 0-2000 meters of depth shows inexorable upward trend despite the so-called atmospheric warming hiatus. 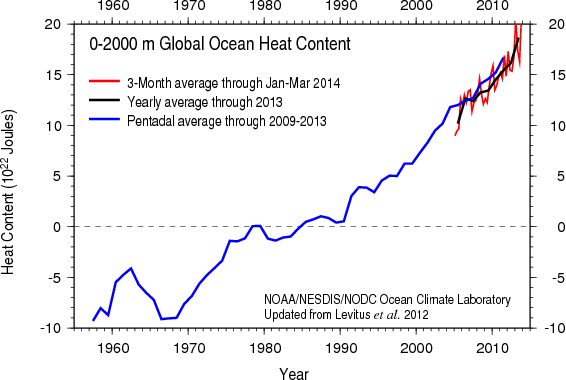 Image source: NOAA Ocean Heat Content. This natural variability, which typically lasts for 20-30 years, began around the year 2000 and has continued through 2014. During such periods of negative PDO, we would expect rates of atmospheric warming to cease or even to go slightly negative. Unfortunately, even though PDO has been negative for nearly 15 years (a phase that during the 1940s to 1970s drove 0.35 C of transient atmospheric cooling against an overall larger warming trend), we have still seen atmospheric warming in the range of 0.1 C per decade. This is bad news. For as ocean heat content is spiking, the transfer from atmosphere to ocean has not been enough to even briefly cut off atmospheric warming. And at some point, the oceans will deliver a portion of their latent heat back to the atmosphere, causing an even more rapid pace of temperature increase than was seen during the 1980s through 2000s period. In other words, we’ve bent the cycle of natural variability to the point where we see warming, albeit slower warming, during times when we should have seen atmospheric cooling. And all indicators — radiative balance measured by satellite, deep ocean water temperatures, glacial melt, and atmosphere — show ongoing and inexorable warming.